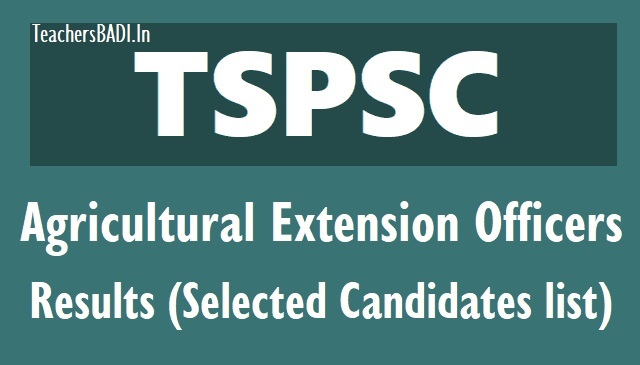 TSPSC AEOs Agriculture Extension Officers Results (Selected Candidates list) 2018/ TSPSC AEOs Provisional List of the Selected Candidates (District-wise): TSPSC/Telangana State Public Service Commission issued Agricultural Extension Officers(AEO) Grade II recruitment notification and Applications were invited Online from qualified candidates through online mode @ TSPSC webportal (www.tspsc.gov.in) to the post of Agriculture Extension Officer Grade-II. On the basis of the CBRT Examination held on 22/11/2017 FN & AN and subsequent Certificate Verification process held from 02/03/2018 to 08/03/2018 and 28/03/2018 & 29/03/2018 at Sankethika Vidya Bhavan, Masab Tank, Hyderabad for Direct Recruitment (General) to the post of Agriculture Extension officer Grade-II in Agriculture and Co-operation Department., 790 candidates with the following Hall Ticket Numbers have been provisionally selected for appointment to the post of Agriculture Extension officer Grade-II in Agriculture and Co-operation Department. Notification No.51/2017, Dt: 10/10/2017, against 851 vacancies notified 790 are filled & 61 are not filled for want of eligible candidates.